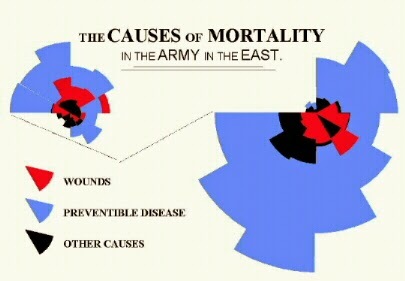 Diagram by Florence Nightingale showing that deaths in the British Army during the Crimean war due to preventable infectious diseases (blue wedges) far outnumbered deaths due to wounds (red) or other causes (black). It's nurses week! Please take a moment to thank the nurses in your life for the extraordinary work that they do. For GeriPal, let's take a few moments to focus this year on thanking the many amazing nurse scientists in geriatrics and palliative care. This is a list of a few of the many nurse scientists who have pushed hard on the boundaries of what is known in geriatrics and palliative care. I've just listed a first few to get the ball rolling. Mary Naylor - Developed the Transitional Care Model, research focuses on helping older adults with chronic conditions receive high quality care and avoid unnecessary hospitalizations. June Lunney - Described and provided empirical evidence for functional trajectories toward the end of life. People with cancer have a clear downward functional trajectory, whereas people with dementia slowly dwindle. Meg Wallhagen - Put hearing loss on the map as a major but often overlooked issue in the elderly, not to mention the elderly in palliative care. Marie Bakitas - Pioneer in palliative care in rural settings. Developed project ENABLE, a telephone based support intervention for people with advanced cancer. Betty Ferrell - THE big name researcher in the field of pain and quality of life for patients with cancer. Chris Miaskowski - Remarkable work in symptoms, symptom clusters, and translational research. Mary Ersek - National leader in palliative care in the nursing home and palliative care for Veterans. Judy Paice - Leading pain researcher nationally and internationally. This list is by no means exhaustive! Not even close. But with your help it could be - please add to this list in the comments and via twitter.